My Monster Hunter: World save file says I’ve played for about 70 hours. You’d think I’d have learned everything this game has to teach me. You’d be wrong. After narrowly winning a tough fight with a High Rank Anjanath, I visited the research center back at HQ and found that my Monster Field Guide had been updated. The Monster Field guide is a database with information on all of the large and small creatures you’ll find in the game. Each time you do a mission, you can study footprints, markings, spoor, and other leavings to raise a creature’s Research Level, which adds information to the database. This time, I opened up my Field Guide and found that the Anjanath entry had been updated with a fourth page called “High Rank Rewards.” That tab isn’t all that different from the Low Rank rewards tab, but it made me slow down and really look over and internalize the information on both rewards pages. In addition to a few smaller facts about the creature’s body parts and weaknesses, I learned that if I ever need a High Rank Anhanath fang, I’ll have to either knock it off while fighting it or kill Anjanath and carve the fang from its corpse. I avoid killing creatures whenever I can these days, since you get more rewards for doing so. I now know that I should hit an Anjanath in the head as much as possible when fighting it. That will “break” its head and cause a fang to drop. It’s a small piece of information, but it’s indicative of just how much this game still has to teach me. (It also follows a wonderfully gruesome logic: if you want a fang, you have to knock it loose yourself.) Each creature in the game has its own Research Level, and the more I track and fight them, the higher those levels will climb. Soon there’ll be another new rewards page for each of them telling me which body parts to aim for, which parts are rarest, and whether I should focus on killing or capturing them. That’s not the only thing I’ve recently learned. In the last few days I’ve also learned new techniques for using my slinger, new types of environmental traps I can exploit, how to do a sliding attack to launch myself up onto a monster’s back, and plenty of other things that aren’t immediately coming to mind. 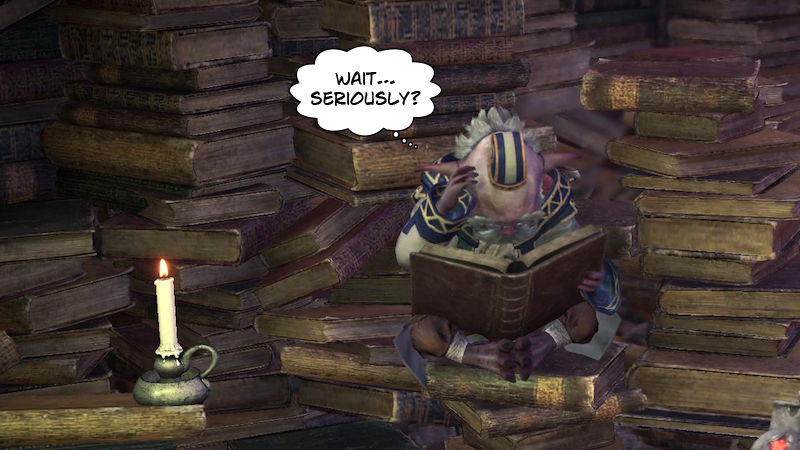 I’ve already written about how impressed I am with Monster Hunter’s approach to loot. It’s a more active system than other loot-centric games I play, and feels much more rewarding as a result. I’m doubly impressed that the game goes even deeper than I realized, giving me the information I need not just to hunt the right creature for the item I want, but to hunt it in a particular way and even aim for the specific parts I’ll need. Monster Hunter: World is not a particularly gentle teacher. This series has been around for almost 14 years, and World bears the weight of that legacy in ways both good and bad. The menus, tutorials, and interface are messy and convoluted, and the game frequently chokes on the volume of information it must impart. Even this more approachable Monster Hunter—which is indeed more approachable!—will still frequently confuse new players. But part of the reason it can be confusing is because there is so much to learn in the first place. I find myself delighted enough by each new discovery that I’m willing to put up with some lousy menus along the way. Seventy hours into most video games, I’ve learned just about everything there is to know. Seventy hours into Monster Hunter: World, I’m still wondering what it’ll teach me next.